This painting is my personal testimony to the selfless valor of the men who paid the ultimate price during Operation Red Wings. 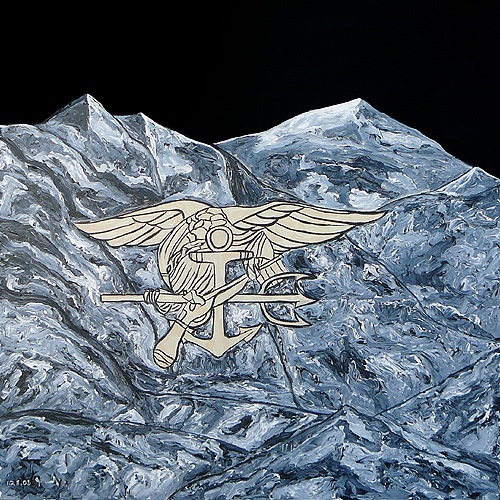 After reading the book Lone Survivor by Marcus Luttrell and Patrick Robinson, I wanted to create a work of art inspired by the bond of battle in the mountains of Afghanistan on June 27th, 2005. These four SEALs — Lt Michael P. Murphy, Marcus Luttrell, Matthew G. Axelson, and Danny P. Dietz — fought like lions against an overwhelming force, leaving everyone but Marcus Luttrell killed in action in the northeast gulch of Sawtalo Sar. Eight more SEALs and eight men from the 160th Special Operations Aviation Regiment also perished in an effort to rescue the ambushed SEALs. This painting was my attempt to say “No greater love hath any man than to lay down his life for his brother”.